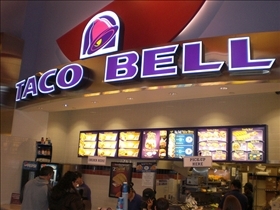 Taco Bell is a restaurant chain that offers Americanized Mexican fast food. With more than 2 billion customers each year, the restaurant has enjoyed its ranking of top spot in Mexican fast food. Not without its share of controversy, Taco Bell restaurants are a moneymaking franchise restaurant that is quickly spreading across the globe. Del Taco is second in line to Taco Bell as Mexican fast food chains go. While their menu offerings are vastly different, Del Taco has a devoted following, despite the smaller market share. With locations mostly in the western states and Texas, there are only a few in the middle and eastern states. A former Marine started Taco Bell in San Bernadino, California. At first, the restaurant was called Bell's Drive-in, but he changed the name to Taco Bell and started his franchise kingdom. There are now over 6,400 Taco Bell restaurants worldwide. Sold to PepsiCo in 1978, Taco Bell is now housed sometimes with Pizza Hut and Kentucky Fried Chicken restaurants. Del Taco started out in 1964 as Casa Del Taco, which means "House of the Taco" in Yermo, California. It was not until 1967, when the bean and cheese burrito with green or red sauce was added to the menu that the restaurant started to make money and expand. Taco Bell offers soft and hard-shelled tacos, burritos, chulupas, gorditas, nachos, and quesadillas, these are the basic offerings. Over the past few years, Taco Bell has worked to become healthier by offering a Fresco menu and fruit smoothies. Del Taco has a very mixed menu, which contains everything from tacos to burgers. You can find practically the same type of Mexican food that Taco Bell offers, but also get a cheeseburger and chili cheese fries. Del Taco also has a breakfast menu. TacoBell started the movie tie-in promotions in 1989 with the release and cross-promotion of Batman. In 1997, Taco Bell launched the talking Chihuahua ad campaign and it ran very successfully until 1999. When the new fresher menu came out, they started the "Think Outside the Bun" campaign. Del Taco's first mascot was a masked character who wore black, but that was discontinued when they were sued, as the character resembled the trademarked Zorro character. After that, Del Taco had a representative named "Dan", who was a bumbling character who got into many humorous scrapes while promoting Del Taco. "Feed the Beast" was a campaign, which was the embodiment of a person's hunger. Taco Bell and Del Taco are industry giants in the Tex-Mex fast food arena. 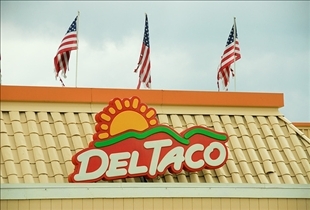 While Taco Bell has the lion's share of the market, Del Taco still ranks right behind them in Mexican fast food. With over 500 stores, Del Taco is a franchise business that is recommended by franchise experts as a great company to own. Taco Bell has had a few troubles with lawsuits and scandals, but nothing seems to slow down the Taco Bell brand from expanding around the globe. Taco Bell has been frying with zero Trans fat oil since 2007 and continues to work fresher and healthier menu options into the restaurant. Both restaurants offer a value menu, but only Del Taco offers a lineup of breakfast burritos. Which fast food restaurant has better food?